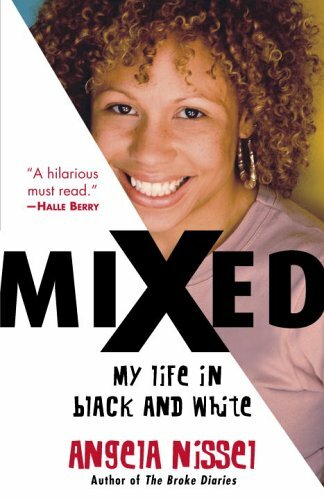 What: Witty and spirited account of Nissel’s mixed race experience from childhood through college, (and a trip to a psych hospital). Nissel alludes to the idea of the “tragic mulatto,” poking fun at it while she describes her quest for popularity in elementary school – having to choose one group of girls over another in segregated private schools. “I was horrified but at the same time grateful that my half-white side saved me from being lumped with black people. I became determined to use that side as an all-access pass to the world of real Barbies and pain-free hair as long as I could” (39). “I stayed in the backseat, wondering if being half-white was some kind of hidden superpower, one you only pulled out in times of danger. When was I supposed to hide it? With black schoolgirls? How come one drop of white blood doesn’t make you white? Who made these rules, anyway, and why couldn’t I get a copy of them?” (80). “I didn’t want to have a mother-daughter mulatto moment like the ones we had after the ‘zebra’ teasings and he your-dad-isn’t-white scuffles. I didn’t want another race lesson or an analysis of how crazy everyone else was and how special I was. I wanted out of the race game. It seemed every time I learned the rules, someone changed them on me. I was tired of fighting…” (98).